Residents in Government Technical College in Lemna, Calabar woke up to a shocking discovery of a man hanging on PHCN high tension power lines looking dark and dried up. 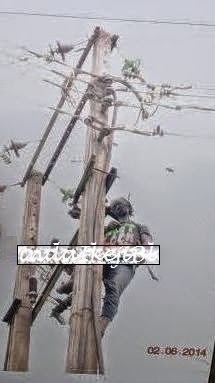 One resident revealed that there was power outage in the early hours of today 2nd of June and they thought it was the usual PHCN blackout only to find the dead man hanging on the wire carrying high voltage of electricity at the break of dawn. Efforts are being made by the Police and other security men to bring down the hanging man before making proper identification.